Money is something which is very important today. Money speaks much louder than words or deeds. Those individuals who do not make much money are hardly able to keep body and soul together in this age of intense expenditure. In the course of an interview, the recruiters are going to be taking notice of everything you say as well as do. If they do not like anything they see or hear, then you will immediately be eliminated from the running. In order to regret something you say at a later point in time, it is better that you think carefully before you give an answer. In all other questions, what you say is not merely as important as how you say it, yet when it comes to this question, you must ensure that you are thinking before you say anything out loud. In an interview, your answers should always be brisk as well as to the point. No one in the business world has the time to listen to long drawn out answers. All companies like to employ people who think quickly as well as on their feet. So when asked this question, do not be in a hurry to give out an answer immediately. Ensure that you do not blurt out a random figure which might give the impression that you are someone who takes rash decisions. No company likes to bring on board individuals who say anything without thinking about the consequences later on. As it has been mentioned above, blurting out any random figure might end up putting you in a very sticky situation, so it is vital that you take your time before you give an answer to this question. Do take enough time to think about what would really be the lowest amount you would expect, but do not take too long to give an answer as that might end up being a little too weird. This is just one of the many blunt questions which will be asked in the course of your interview so do not fixate on just this one question. 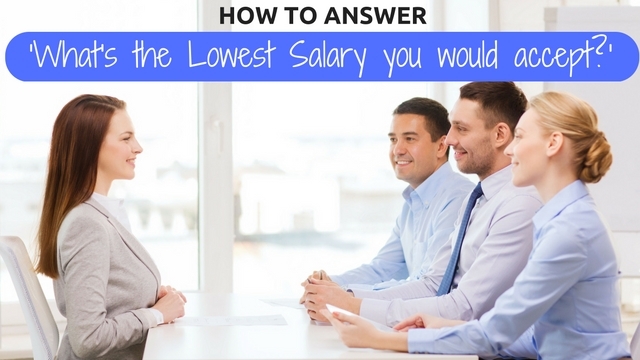 It is rather unfortunate that many people think that the lower the amount they ask for, the more chances they have of actually getting the job. Big companies do have the resources to pay their employees adequately. They just ask this question to see how you gauge your own qualities and abilities. Sometimes asking for a very low amount is equally harmful as it shows you to be someone who is lacking in confidence as well as someone who has no idea about the worth of things in this day and age. All questions asked in an interview have a dual intent. When the interviewer asks you this question, he is not always looking for an exact figure. Chances are that he is asking the question, just to see how you react to being asked it. So in such a situation there is absolutely no need to fret or get nervous. If you have not exactly thought of an exact figure it is always a safer option to be a little ambiguous. In this way, you are not giving away too much. If your answer is a little ambiguous, the recruiter will understand that you are someone who is rather sharp. If you have stated your answer, along with the number you have stated ensure that you also mention that what you said and the figure you quoted is open for negotiations. In this way, you show that you are someone who is mature and has an eye for business. It is only those who are meek and submissive who shy away from negotiations. Those who like negotiating are naturally business minded and are usually able to even sway the opposite party. On going for an interview, you must always put your best foot forward so that you are able to impress. In the course of every interview, recruiters ask a few tricky questions, just so that they can see how smart or silly the candidate is. This question happens to be one of those trick questions. No matter what figure you mention, chances are that the company has already decided what they are willing to pay you. It is for this reason that when you are asked this question you should not make the mistake of getting confused by the word ‘lowest’. Just because it is including the word lowest, that does not mean that you have to quote a figure which is ‘low’ as well. Just because this is a question involving the amount you will receive, that does not mean that you simply state the amount and be silent. Keep in mind that interviewers ask a limited amount of questions in the course of an interview, so you must make each question count. When answering this question, be mindful of your body language as well, because that too is something which will be taken into consideration. Do not dismiss this question as one which is not important; rather think of it as one of the most important question. Rather than being completely blind about what to say when asked this question in the course of your interview, it is advisable that you do some research prior to the date. The interview is something which is a great boon to us in today’s times, and we should make the maximum use of it. In order to help you come up with a figure, you should make the use of the internet in order to find out just how much others in your position, do receive. This will help you a great deal in coming to a satisfactory as well as fair answer. As it has been mentioned above, you should do some research from before hand to find out what others in your post and with your qualifications get paid, however along with this you should also consider your own worth. Just because others get that amount, that does not mean that you have to settle for that much as well. Think about what things you as an individual bring to the table and whether these things could impact the salary which you receive. Think about things from every angle before finally coming to a conclusion. In the event of trying to sound very forward and very bold you should not quote a figure which is too high and rather unreasonable. If you quote a number which is simply to extravagant then you will immediately be eliminated as a candidate. Recruiters do not have time to waste on people who they think are incompetent and if you answer in an unrealistic sum, they will think of you as someone who is completely cut away from reality. Being assertive about your wants is one thing, but being silly is something which is entirely different. That is why, you should think before you talk. There are many individuals who simply shy away from talking numbers because they think of it as something which is crass and impolite. However in the course of the interview, if you are asked this question, you should not let silly thoughts like this come into your mind. If you are asked this question you should answer without having any hesitation in your mind. DO not show yourself to be someone who cannot talk in numbers in a mature and business minded fashion. Negotiation of salary is something which is very important indeed. Interviewers like candidates who have a backbone of their own and do not shy away from direct talk. So once you are asked this question one of the worst things you can do is throw the ball back into the court of the recruiter, by saying something like, whatever you think is alright will accept it. In this way you show that you are unwilling to take a stand for yourself and that you lack an opinion. These little mistakes which you make in the course of your interview could cost you very heavily in the long run, without you even realizing it. If you really believe that you deserve a particular amount which is a little steeper than usual, then you should not shy away from stating the amount. In the course of an interview it is very important to be completely honest. There is no point regretting your words at a later point in time. So if you have something to say, you should go ahead and say it without any fear in your mind. In the business world if you do not stand up for yourself then no one is going to go ahead and stand up for you. To bag any job, you need to be smart about it. If your interview does not go well, then you cannot expect to get the job. In this day and age if you fail to impress, when a chance is given to you, then it could easily slip through your fingers. There are plenty of capable people who could easily take your place if you happen to slip up. So to come across as very analytical, once you have given your answer you should state categorically why you have selected this amount as well. In order to really show that you are someone who is much sought after, you should mention other offers which have come your way. State that of all the offers you have received, this amount is the least and therefore that is the lowest you will accept. In this way you will show that you are someone who is very fair and that you never do things without a reason. Along with this you will silently communicate to the recruiter that you are someone who is much sought after, so you need not stop before them in order to bag the job. These are just some of the many tips you can make use of when you are asked this question in the course of your interview. Interviews are a very daunting experience for one and all, but the key is to channelize this anxiety in the right direction. If you let your nervousness get to you in the course of your interview then you will never be able to create a good impression in the mind of the interviewer. So rather than being completely baffled when this question is asked to you during an interview, it is always better that you prepare an answer in mind. The better prepared you are for an interview; the less nervous you will feel in the course of it.